make sure you have your Season Ticket and Programme Voucher in your pocket, wallet, purse … so that you can collect your PROGRAMME BOOK and find your seat. Margaret Packe will be at her usual spot in the Meon Area before the concert to assist you. She will also have tickets for the December Concert at Oaklands School, Waterlooville - of which more details below. Those who knew Pauline from her pre-concert talks and her attendance at Society occasions must have noticed her absence at concerts since last March. It is with great sadness that we have to tell you that she died in July soon after the HSO concert and after a relatively short illness. Pauline was a brilliant pre-concert speaker and a dynamic and dedicated supporter of the Orchestras, full of enthusiasm and bursting with ideas to strengthen the Society and all who met her will remember her as a wonderfully warm and lively person. The Orchestras owe her an enormous debt of gratitude and we shall all miss her greatly. This first concert by the Chamber Orchestra is dedicated with great affection to her memory. Many members of the Society attended Pauline’s funeral at Chichester Cathedral and we were privileged to be invited to provide some of the music for the service. 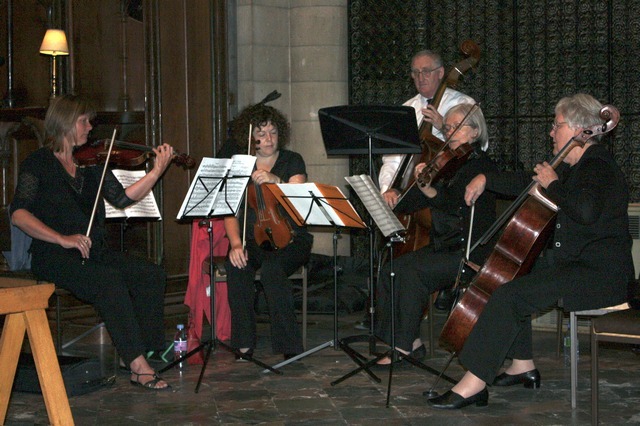 The musicians were Kirstie Robertson and Angela Blackwell, violins; Joanna Emerson, viola; Jean Graham-Jones, cello and John Thomas, double bass and they played music by Dvořák and Rossini. Before the service a visitor from Canada, Lili Szakony took photographs of the players which she kindly forwarded via e-mail and one is reproduced here. At the AGM it was announced that we made a small deficit last season which was a large improvement on the previous season. The Committee was re-elected with the exception of Margaret Packe who has stepped down after many, many years of service. To our great relief she will continue with her role as Tickets Secretary and we shall continue to turn to her for her perceptive insights and comments. The Committee were thanked for all their work and an extra-special vote of thanks was given to Margaret. Geoff Porter, who was co-opted on to the Committee in mid-season to become Friends’ Secretary, was elected as a full member and we were very pleased to elect and welcome Steve Bartholomew on his return to the Committee after a few years’ absence. A weakness in the Society which has been acknowledged for some time is our over-dependence on two key people – our Musical Director Peter Craddock and his wife Sandra. Steps are being taken to gradually nibble away at their load and share it with others! All volunteers welcome – applications to me, please. I’m sure that by now you have all adjusted to the re-organised arrangements for our next concert. The tickets for 4 December are selling very well, even before the main press publicity has been published. However, if you are wary of travelling to unfamiliar Waterlooville on a dark December night, may I suggest that you have a trial run in the daylight? You could extend your exploration by booking lunch at South Downs College Restaurant (023 9279 7952) to celebrate your achievement as it’s between the A(3)M exit and Oaklands School. (No, I don’t have shares in the College but have eaten many delicious meals there!) So please relinquish any qualms about travelling into the unknown. The hall is easy to find, has excellent free parking, has easy access for those with mobility problems and excellent sightlines. Also, if you have transport difficulties or you could offer a lift please let me know. One important point that Sandra has asked me to make for EVERYONE coming to the concert from the A/M27 is that there is a small but crucial correction to the map on the reverse of the tickets: the exit from the A(3)M is JUNCTION 4 and not as indicated. As none of the London Conservatoires felt that they had a candidate whom they could recommend for the Bob Harding Bursary this season we have asked Sam Draper to stay on for another year and I am very pleased to announce that he has accepted. You may remember that Sam stepped in to take our pre-season Hayling Island concert last year and achieved a notable success. This year he again gave players and audience great pleasure with a stirring performance. We look forward very much to another season working with him. And now - what a delightful way to start the season. The concert on Saturday promises to be a great treat and how good it is to welcome Jamie Walton back as soloist. I look forward to seeing you all there. Another season of concerts is with us – our 49th and I can’t believe we’ve been going so long! What a lot of music has flowed under the bridge during those years. Amazingly it is still possible to devise a series of concerts each of which includes music we have never previously played. The long Summer months when rehearsing and concerts stops but busy pre-the-next-season publicity preparation reaches its zenith have been as assiduous as ever in the Craddock household and elsewhere. Sadly our thoughts at that time were overshadowed by the death of Pauline whom we shall miss most seriously. Such enthusiasm, so many exciting ideas and such tireless work on behalf of ‘her’ Orchestras will be hard if not impossible to replicate. The feature which attracted Pauline and her husband Nicholas to our concerts was the spirit of enterprise in our programmes – the opportunity of hearing and encountering unfamiliar works from time to time. More information about the players and details of the music on Saturday. Saturday’s pre-concert talk will be about the different string instruments of the orchestra. or to show off your skills if you are already a string player. Come and learn about the special ingredient that Stradivarius (a famous violin maker) added to the wood he used to make his violins. Guess how many hairs there are in an average violin bow - no counting before Saturday! The advantages of moving to Waterlooville include lower hiring charges and lower ticket prices. However, the big change will be that we shall be in charge of all the things we take for granted at Ferneham Hall - ticket sales, stewarding, pre-concert, interval and post-concert refreshments to name but a few! Our usual Front of House crew will be on hand but we shall need lots more willing hands, so please offer your services! No training, but advice and advance information will be given. As there is a large Dining Hall, it would be really wonderful to have ‘AFTER-THE-CONCERT NIBBLES’ which have been missing for some time - but again we need someone to organise them and others to provide them - could one of these be you??? This, of course, will be THE BIG ONE! 50 glorious years of the Havant Orchestras and the programme is already chosen with help from the players (for the very first time). At the AGM a special GOLD FUND was launched because the programme involves rather greater costs than usual. This is completely separate from the Friends and the challenge was not to give cash but to raise it by any (legal) means anyone can devise. By the end of the evening four projects were proposed and one is already operating. make craft items - the list is endless! So please pick up a leaflet on the table in the foyer on Saturday and then let Sandra (023 9248 3228) know what you are planning so that your project can get publicity in the next Newsletter. c/w Espana, Habanera, Danse Slave, etc! Browse before the concert, during the interval and afterwards as well!